Ryorin's Ramblings: Conflict of Hugo Proportions: Brian Versus Agatha! Conflict of Hugo Proportions: Brian Versus Agatha! Earlier today, I was looking at the news on Marvel's website when, lo and behold, I saw this! Captain Britain and MI13 is up for the "Best Graphic Story" Hugo award for it's third volume "Vampire State", in which Brian (aka Captain Britain) and his stalwart cohorts fight vampire. Who live in a castle. On the moon. Why does this awesome news make me conflicted? I love Captain Britain and MI13, I really do. I think it a horrible shame that it was canceled. It would be wonderful if it got a Hugo. 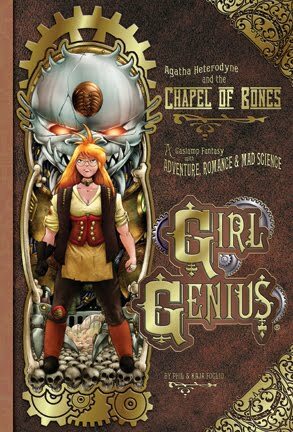 But I absolutely love Girl Genius. It may be my single favorite American comic series. I was overjoyed last year when it was nominated for the category and was overwhelmed with happiness once again when it won, becoming the first graphic novel to win a Hugo. And now if one wins, the other doesn't. Fortunately, I'm not part of Worldcon and I won't have to choose between the two of them. As such, I can take comfort in the fact that I love two of the five nominees for the category and can root for both of them, and that the nominations alone ought to bring attention to both books. I guess my internal conflict, then, is not which to root for, but which I would rather have win: the winner from last year or the superheroes that were tragically canceled. But when I really think about it, it doesn't matter. I'm happy that both were nominated (and that Fables was, too, but I haven't read that volume yet). I'll be happy with either one winning. So, in honor of these two wonderful comic series being nominated, I shall follow up this rant with one gushing about Girl Genius (which I've been planning on doing anyway) and then another on Captain Britain and MI13. As the previous post states, I'm rather busy at the moment, so I'm not sure when I'll have these posts completed, but it'll be in the near future. Good luck to all the Hugo nominees! May the Force/Spark/Self-confidence-that-now-fuels-your-powers be with you! OOh, now I have to read all of the comics you listed!